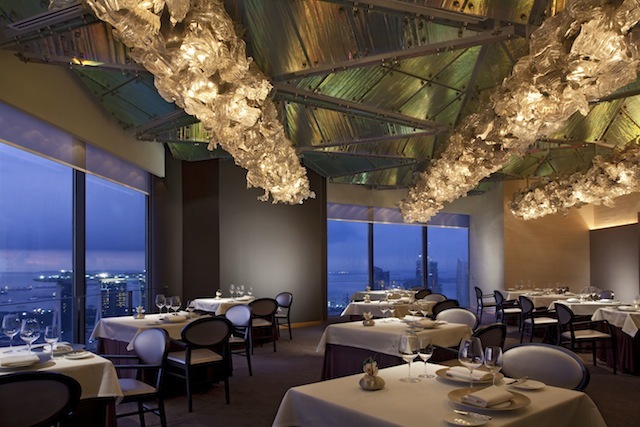 JAAN is an intimate, 40-seat restaurant located on the 70th floor of the luxurious Swissôtel The Stamford in Singapore. Derived from the ancient Sanskrit word for ‘bowl’, JAAN’s interior features a lavish Murano crystal and silver free-form chandelier that spans the entire length of the ceiling – it’s an elegant representation of ocean waves that complements the restaurant’s panoramic and enthralling sea view. But what really sets JAAN apart is its truly exquisite culinary experience that has become the hallmark of this multi-award winning restaurant. JAAN’s kitchen is helmed by extraordinarily talented Chef de Cuisine Julien Royer who’s trained under famous names in French cuisine such as Antonin Bonnet, Bernard Andrieux and the legendary three star Michelin chef Michel Bras. Since taking the reigns at JAAN, Chef Royer has received numerous accolades, including the World Gourmet Series “Rising Chef of the Year” 2012 and the “Best Dinner Experience – Western” Award of Excellence at this year’s G Restaurant Awards. 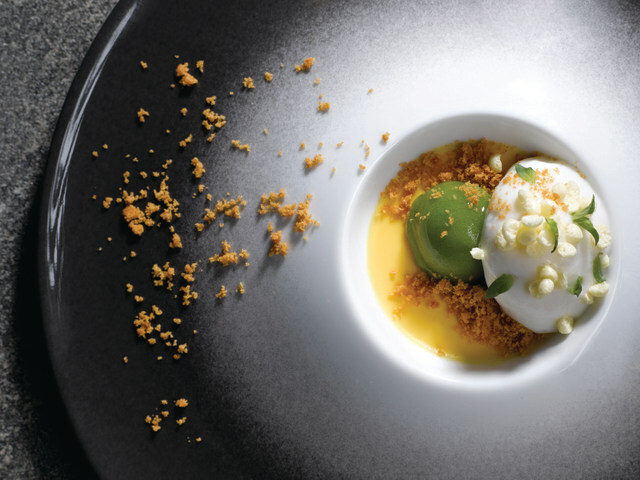 Dedicated to showcasing the finest modern French cuisine in Singapore, Chef Royer’s artisanal menu is built around a passion for highlighting the freshest ingredients through intricately beautiful dishes that reflect both culinary tradition and creativity. The result is imaginative, innovative cuisine that celebrates and respects seasonality, terroir and the skills of the world’s best gourmet producers. With impeccable service bestowed upon each and every single customer, JAAN is the restaurant you must experience if you’re a discerning epicurean who truly appreciates great food and wine, and are a seasoned traveler who has dined at some of the best restaurants around the world. We were fortunate to have been hosted for an incredible multiple course meal at JAAN and had the pleasure of meeting Chef Royer. Stay-tuned for our complete review of this outstanding restaurant — we can honestly say it was one of the best dining experiences we’ve had to date.